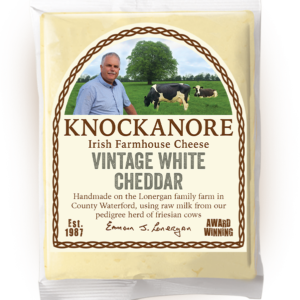 Knockanore Oakwood Smoked Mature Cheddar starts its life the same way as our Vintage White Cheddar, which is made using raw milk on our farm in Ballyneety, Co. Waterford. All of the milk used comes from our pedigree herd of Friesian cows that graze on the lush rolling hills of the countryside. Selected wheels are cold oak smoked for ten days using a traditional kiln. 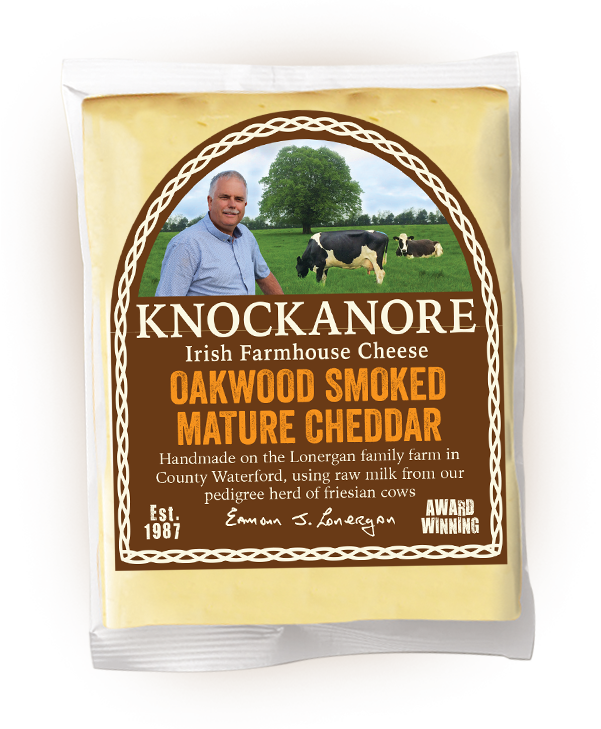 The oak used is sourced locally from the neighbouring town of Lismore. The wheels are then aged on-site for a minimum of six months. 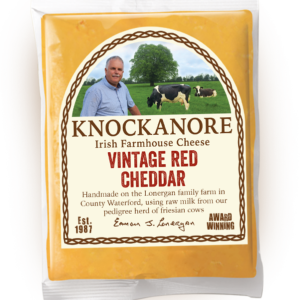 The exterior of the cheese is light mahogany in colour, with a rich yellowy interior. 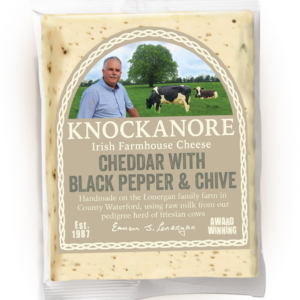 The long smoking process gives Knockanore a smoky, almost meaty flavour that packs a punch. Cheddar cheese (milk), naturally oak smoked. Enjoy it on its own in a big chunk with some crusty bread. It’s great served with a sweet onion marmalade. It also works really well as a burger topping to add that smoky barbeque flavour. 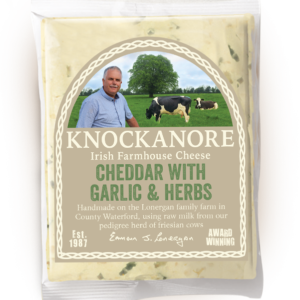 We always recommend removing the cheese from the fridge a half hour or so before serving to allow the flavours to develop. If you are pairing with wine, try and stick to zingier and more mineral styles of white such as an Alsace Pinot Blanc, but try it with a lager style of craft beer such as Eight Degrees Barefoot Bohemian, and you won’t be disappointed.